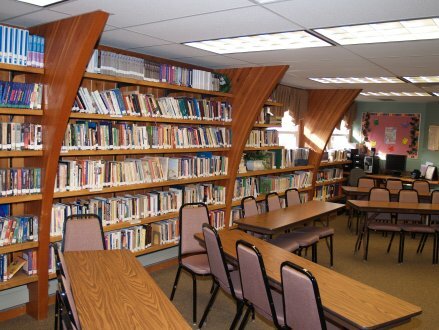 Our Library is located upstairs, across from the church’s main office. This ministry provides valuable Christian resource material, such as: books, tapes, videos, and other media on a vast array of topics, all from a God-honoring perspective. Here, one is sure to find a variety of resources to help along this journey of faith. Whether you are interested in: a study to help you grow in your walk with Christ or deepen your understanding of God and His character; a means of encouragement through difficult times; or simply morally sound entertainment for you and your whole family, the GAC library definitely has a broad selection of things to choose from to help you do just that, and so much more! The library is an example of biblical stewardship – common resources used to meet needs. Although library volunteers maintain it, YOU are the library stewards. The following guidelines are provided to help you use the library responsibly. Anyone who regularly attends GAC. You do not need to be a member. Children should always be accompanied by an adult. You may visit the library at your own convenience. There is an open door policy. Whenever the church is open or staff is working at the church, the library is open for you to use. HOW DO I USE SOMETHING FROM THE LIBRARY? To use something from the library you should check it out (even if you need it for a short time). You make your selection, fill out the sign-out card (with the date in which you signed out the item and your full name), then place the card in the black sign-out box. You may check out 2 items from the Audio/Video and up to 4 books per person. HOW LONG CAN I KEEP ITEMS I CHECK OUT? Videos for one week, Books, etc. for two weeks. Just inside the library door to the left is a cart with a blue basket that is used for returning items. This is our library drop box. IF I NEED MORE TIME CAN I RENEW ITEMS? Yes, there are renew slips placed near the black sign-out box. Fill out the slip with the needed information and place it in the black sign-out box. The library workers will update the book card. WHAT IF I DECIDE NOT TO TAKE AN ITEM I’VE PULLED FROM THE SHELF? Please place the item in the drop box and the library workers will put it back on the shelf. WHAT IF I DON’T RETURN SOMETHING WHEN IT IS DUE? Someone else won’t be able to use it. When an item is overdue, we will send you up to three reminders. After that, we will assume it is lost. (However, if you know it is lost, please notify the library). Since it costs money and time to send reminders, it is better to return or renew items. If you have any items overdue, we ask that you refrain from checking out anything else. WHAT IF I LOSE OR DAMAGE SOMETHING? If an item is damaged, bring it back to the library – we can repair some things. If the item is destroyed or lost, please let us know promptly. We do not require that you purchase replacement materials. However, if you can, we ask that you try to replace items that you lose or damage beyond repair. CAN I MAKE DONATIONS TO THE LIBRARY? Absolutely! Donations are always welcome. The items given become property of the GAC Library and will be used or not used depending on the suitable needs of the Library. Please take time to visit the library often to take advantage of this wonderful ministry! Those interested in assisting in the library ministry may contact the church office at 724-588-7167 for further details.